Good day, fellow princesses! 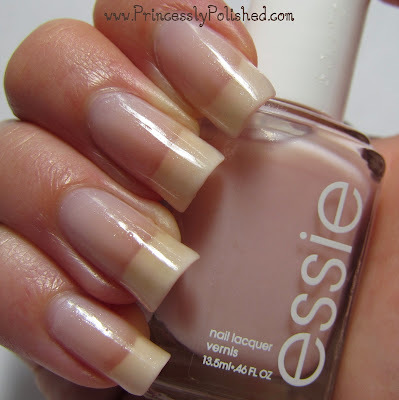 I have a delicate nail look to share today featuring two pretty polishes. The above photo are my nails modeling 1 coat of Black Cat Lacquer over 2 coats of Essie Vanity Fairest. I loved wearing this manicure! Onwards to my reviews! I placed my first order with Black Cat Lacquer at the very end of December, and had four pretty polishes show up in January. I tried a few times to get them swatched, but never did because of the smell. This was honestly the first time a polish smelled so bad that I couldn't stand to use it. 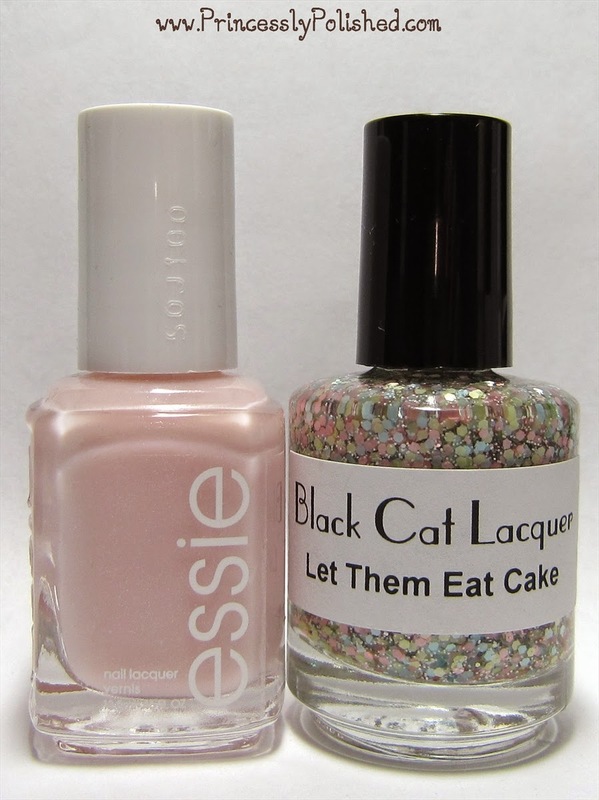 My bottle of Let Them Eat Cake (and the other 3 colors I bought at the time) goes beyond the usual "smelly polish" scent and heads straight into exterior house paint territory. I'd know - my day job is selling and tinting paint! I decided to set them aside until warm weather when I'd try again with open windows. Thank you for your inquiry! The base we use has your run of the mill nail polish odor, thanks! You see, Let Them Eat Cake is an awesome glitter topper - clear base, pastel hexes in pink, blue, and yellow-green. A whole lot of cute tiny white glitter and a smattering of holographic bits. It's pretty, I loved wearing it, but my bottle smells so bad! I don't know if it is worth keeping in my collection if I can't stand the smell of it. We shall see. I didn't have any other issues with the polish; it mixes easily and the formula and application is perfectly fine. BCL is also 3-free and cruelty free, which is great! Thanks for reading! If you have any advice on what to do about the stinky glitter polishes, I'd like to hear it. Do you own any Black Cat Lacquer polishes? If so, which one and how does it smell like to you? If not, they can be found at http://www.BlackCatLacquer.com/.